I had heard of how amazing the Victoria Falls is and had even seen the pictures of the tantalizing tourist magnet in Zambia. The stories and the photos gave me an idea of how Victoria Falls was like but the experience I had while visiting the site was completely astonishing and was nothing close to what I had imagined earlier. 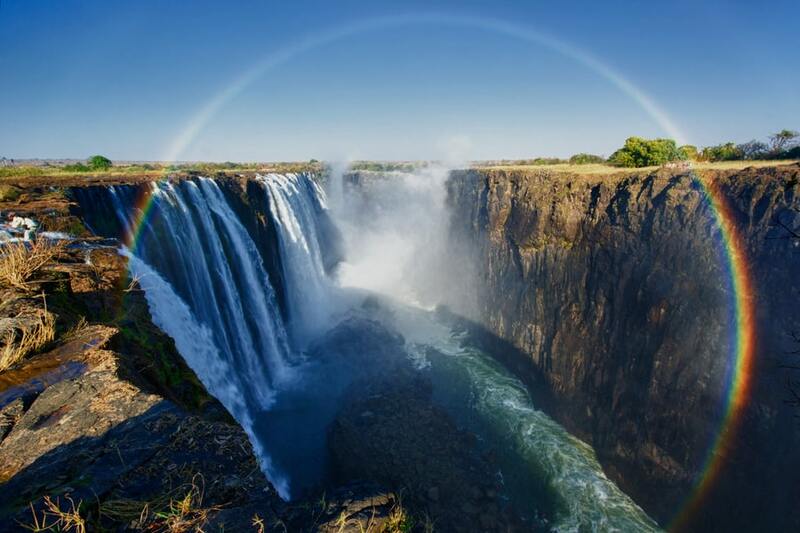 If there is a place that will leave you truly happy and satisfied after a visit, it is the Victoria Falls. I decided to take a train from Bulawayo to the Victoria Falls train station. There were other means of transport but I wanted something that would enable me to see a lot on the way and snap photos that I would send to people back home. I believe photos are one of the best ways to capture a moment and save it for a lifetime. The train ride is very long when coming from Bulawayo to Victoria Falls. I arrived there in the morning, around 9 o’clock and the train had departed from Bulawayo the previous evening, somewhere around 8 o’clock. Although there were some delays, I managed to enjoy the long ride to Victoria Falls and I also enjoyed the night since the place I was sleeping on was comfortable. On the way, I got to see wildlife roaming around, may be looking for prey and others were just enjoying busking in the morning sun but there were a variety of wildlife that could be seen. This was during the last hours before reaching Victoria Falls. The scenery is just amazing especially during the sunrise. If you will be visiting and you also decide to take the train ride there, then you should make a point of getting up early before sunrise so that you can enjoy the view at that particular time. Once I got out of the train station, I headed to the entrance of the falls together with my friends. If you happen to visit there during the summer, put on very light clothes since it can get very hot especially during midday. The Falls are located in the main street that goes through the town center. You can choose to be transported there but it is a walking distance and it would be great if you could walk so that you can also get to enjoy the scenery of the town. As I was making my way there, I noticed that there were vendors in the parking lot and they were hiring out raincoats and maps that one can use for the tour at the Victoria Falls. I wanted the full experience of being washed with the water so I did not get the raincoat. I had to get waterproof covers for my phone and passport though. Entrance fee is needed to get into the Victoria Falls Nation Park but it is not expensive. I had heard of the ‘Chain Walk’ and I decided that is what I wanted to do. With a guide, we made our way through the tunnels of the rain forest and we came across stairs that would take us down to the famous ‘Chain Walk’ and there we got to see the Devil’s Cataract. The view is fabulous and you may even think that you are in paradise. I got to see the falls whose water volume was large at that time and I could also see the rainbow from where I was. If you happen to visit the place from the Zambian side, then do not miss to go to the ‘Chain Walk‘. It was fortunate enough that I visited at the time of the full moon. During this time, there is a wonderful lunar rainbow that can be seen when the full moon is rising. The experience is not the same all the time since the clarity depends on the weather but it seems I was fortunate enough during my whole vacation. The sky happened to be clear and I along with my friends were taken along a tour to see the Moonbow or the Lunar Rainbow as it is commonly known. If you want to propose to your girlfriend, this would be the perfect place to do it. Never will anyone forget the amazing view here during the night.